This book asks one big question: How much are we obligated to the community we grew up in? The protagonist, Grant Wiggins, is an educated man living in the impoverished rural Louisiana town of his birth, and he has one foot out the door [the first line of the novel is, "I was not there, yet I was there."] when he is asked to teach Jefferson, a condemned man, how to be a man. Wiggins struggles with being forced to invest himself in a community that he wants to leave, although he can't bear to. Ultimately, by being truthful with Jefferson about his own ambivalence, Wiggins is able to inspire him to raise his head and hold it high right up to his execution. In return, Wiggins is inspired to reclaim both his Christian faith and his role in the community. There are so many stories of noncommittal young men who don't know which direction to take in their lives until a character close to them suffers a tragedy, which spurs them go on to become better men. I knew how this book would end of the second chapter. 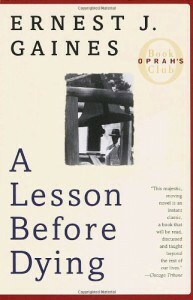 Gaines was handicapped by the span of the book (from sentencing to execution), and the need to mix a grim and unavoidable fate with life, hope, and inspiration. Pretty clear how that was going to turn out. On the other hand, I learned so much from this book. It's easy for people outside the situation to ask why a smart, educated young man would choose to stay in his dead-end town and teach the sons and daughters of poor farm labourers. If it were me, one might think, I would get as far away from that town as possible. The American dream, after all, is to take one's talent and work tirelessly to turn it into a bright future for oneself and one's family. But, as a black man, Wiggins is denied the fullness of opportunity in pre-Civil rights Louisiana. Even more, he seems to feel obligated to stay and give back to the children in his community. He knows how little they have, how little hope and how little future there is for them, and how unjust their world is, and in the end he just can't walk away and leave them to it. This is a lovely book about an awful (and ongoing) situation. The reader is brought to heartbreaking sympathy for even the hardest characters. Wiggins, who is bitter and restless, is not a very likeable man at the beginning of the book. The women in his life are stern and ungiving. Jefferson has lost all hope and all self-respect. But the reader never has to question how the characters got that way. By filling in everything the reader needs to know about the community, Gaines makes it very clear that these characters never chose poverty, ignorance, racism, or lack of opportunity. I would not say the ending is happy, only that it is the best one possible under the circumstances. Emotionally this is a filling book, and Gaines has done very much with very little. Recommended.